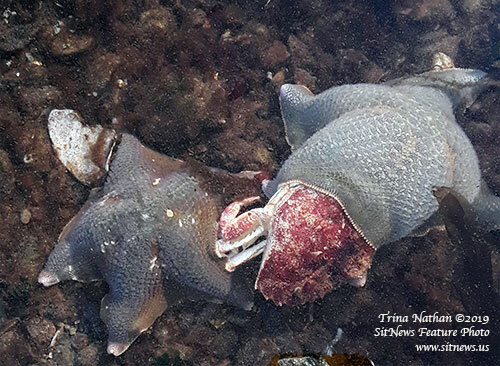 This feeding starfish was photograph in Hydaburg. Southeast Alaska: Southeast pink salmon forecast cause for concern, cause for conservation By JENNY WEIS - As the days grow longer and summer plans start to materialize, ‘18 million’ is a number on the mind of many across Southeast Alaska, especially those in the numerous industries that rely on salmon fishing. Eighteen million is the number of pink salmon the Southeast forecast shows could be harvested in the 2019 commercial fishing season. The Southeast pink salmon harvest follows an every-other-year pattern, with the odd years usually being more productive. However, models by Alaska Department of Fish and Game and the National Oceanic and Atmospheric Administration put this years’ harvest at about half of the recent ten-year average. For seiners, low pink forecasts mean the fleet depends most heavily on hatchery returns of chum, often resulting in many fishermen huddled in a small area, waiting their turn. Alaska: Governor Dunleavy Holds Statewide Roadshow to Outline Permanent Fiscal Plan for Alaska;Senate Democratic Leader Says Governor's Townhalls are Private & Paid for by Multi-Billionaire Special Interests By MARY KAUFFMAN - Alaska Governor Michael J. Dunleavy announced earlier this week a series of community focused discussions and meetings to outline a permanent fiscal plan for Alaska, including the vision behind his FY2020 budget proposal and a package of constitutional amendments meant to address the state’s long-term fiscal stability. “A Statewide Discussion for a Permanent Fiscal Plan” meetings are scheduled in Kenai, Anchorage, Fairbanks and Nome. Several of the meetings will be broadcast live online. Alaska Governor Michael J. Dunleavy announced earlier this week a series of community focused discussions and meetings to outline a permanent fiscal plan for Alaska, including the vision behind his FY2020 budget proposal and a package of constitutional amendments meant to address the state’s long-term fiscal stability. “A Statewide Discussion for a Permanent Fiscal Plan” meetings are scheduled in Kenai, Anchorage, Fairbanks and Nome. Yesterday, Senator Donny Olson (D-Golovin) sent a letter to Governor Dunleavy (pdf) expressing concern about holding such private town halls. According to Olson, the 415-word terms and conditions on the Americans for Prosperity website demanded Alaskans give up constitutional rights to attend or they will be asked to leave. In response, Senator Olson has offered to personally pay for the use of Old St. Joe's in Nome for the March 27 event to allow for the public at large to attend and voice their concerns without stipulations placed on them. "This budget impacts all Alaskans, but disproportionately in my region of the state. My constituents are outraged that Governor Dunleavy is using public resources announcing an event to promote American's for Prosperity's political agenda," said Sen. Olson. "I am providing this opportunity for Governor Dunleavy to leave Americans for Prosperity's political propaganda behind and hear from all Alaskans, no matter their political background or stance on his agenda. I hope the Governor will take me up on this offer." The letter was hand delivered to Governor Dunleavy's office in the Capitol Wednesday morning. On March 19, 2019, according to a news release form the Senate Democratic leader, details surfaced that the Governor's roadshow events are private and paid for by Americans for Prosperity - Alaska, which is founded and funded by the multi-billionaire Koch Brothers from Kansas. The organization announced these private events are "dedicated to discussing Americans for Prosperity's issues." "On the campaign trail, then-candidate Dunleavy promoted restoring trust in government as one of his main themes for his administration. 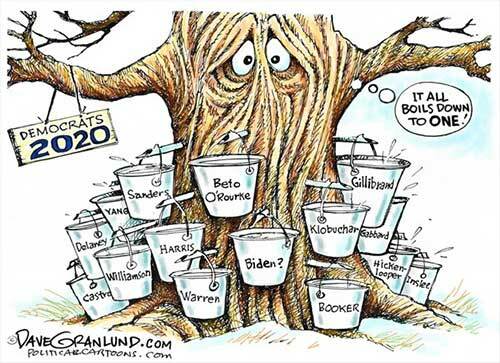 Now that he is governor, countless campaign promises continue to be broken. This represents one more failure of trust by Governor Dunleavy and his Administration," said Senator Tom Begich (D-Anchorage). Begich said, "Holding private events to promote his anti-Alaska agenda, which is sponsored and paid for by special interests that are funded by radical outsiders, is not the Alaskan way. Alaska's governor should be open, transparent, and dedicated to serving Alaskans, not multi-billionaires from Kansas and their political agenda." According to Senate Democrats, on the event website, Americans for Prosperity provided a 415-word disclaimer on the terms and conditions of the event (pdf posted by Senate Democrats) which threatens Alaskans if they do not comply with their rules. If you don't follow these set rules, you will be denied admission or forced "to leave the event." "I encourage Governor Dunleavy to cancel these events paid for by outside special interests. The Governor has an obligation to promote open and transparent public forums where all Alaskans can come and freely express their ideas and concerns about the state's budget and policies without fear of retaliation if they do not share the same agenda," continued Sen. Begich. Alex Davis, a WWAMI medical student from Girdwood who is just completing a rotation at PeaceHealth Ketchikan Medical Group and on Prince of Wales. In 1971, five students enrolled in the first medical school in Alaska. The class, at the University of Alaska in Fairbanks, doubled the next year and, by 1989, had twenty participants each year. Now, nearly fifty years later, the WWAMI program accounts for almost 12% of the entire physician population in the state. WWAMI, Washington, Wyoming, Alaska, Montana, and Idaho, is part of the University of Washington Medical School, considered the number one primary care medical school in the country. WWAMI supports programs in the states that can’t offer medical schools through their own university system. 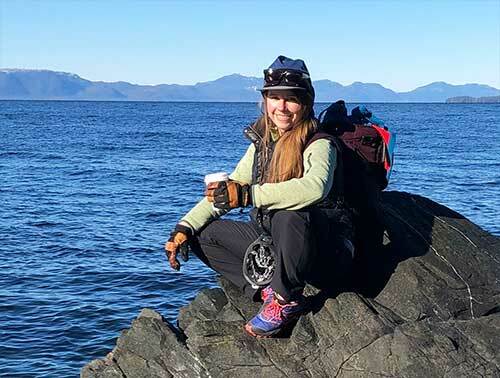 Alexandra “Alex” Davis is a WWAMI student who has been at PeaceHealth Medical Group Primary Care Ketchikan and Prince of Wales during parts of her first three years of medical school. Most recently September 2018 to March 2019. “All my life I’ve wanted to be a physician in my community where I can take care of my friends and family.” She said recently. “That would be an incredible life. Originally the first two years of medical school were in Alaska with the final two years in Seattle but, as of 2017, almost all four years of medical school can be accomplished in state. Marina Anderson, and Desiree Jackson. 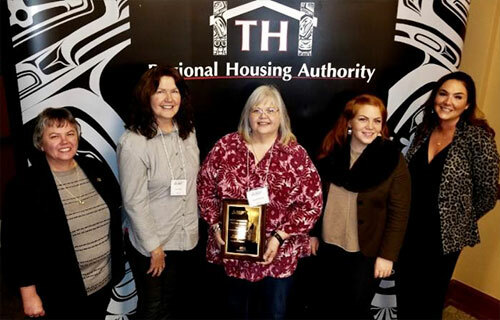 Southeast Alaska: Organized Village of Kasaan Receives Community Partner or the Year Award - The Tlingit-Haida Regional Housing Authority (THRHA) recently hosted the First Annual Southeast Housing Summit in Juneau. This inaugural two-day event which closed on Thursday, March 14 th brought together participants from throughout Southeast Alaska to explore this Summit’s theme of “Planning Our Future Through Housing.” Participants represented a variety of housing-related industries including real estate, contractors, local government, mortgage and finance, tribal management, and various Alaska Native Corporations. At the Summit, the Organized Village of Kasaan received THRHA’s 2019 Community Partner of the Year Award. “Kasaan’s population has grown by 63% since 2010, largely in part to the work that the Tribe has done to spark economic development,” said Joyce Niven, THRHA’s Interim President & CEO. “As a Tribal Partner, Kasaan has been a model partner.” - More..
Alaska: Alaska DOT&PF Issues RFP for AMHS Economic Reshaping Consultant - The Alaska Department of Transportation & Public Facilities (DOT&PF) issued a request for proposals (RFP) seeking qualified vendors for an Alaska Marine Highway System (AMHS) Economic Reshaping Consultant. The Alaska Department of Transportation is soliciting proposals to identify potential reductions of the state’s financial obligation and/or liability as related to the Alaska Marine Highway System. Alaska: Governor Dunleavy Releases 10-Year Budget Blueprint for Alaska; Plan builds the economy, promotes job growth, preserves PFD - Today Governor Michael J. Dunleavy released his State of Alaska Fiscal Plan for FY20-FY29. The plan is based on projected revenues from the spring 2019 revenue forecast, the administration’s proposed balanced budget, and the enactment of the administration’s legislative package to create a permanent and sustainable fiscal plan. The ten-year plan also contains three alternative approaches to solving the State’s fiscal problem. The additional scenarios do not reduce the size of government. Instead, those alternatives make up the revenue shortfall over the next decade through PFD cuts, emptying reserve accounts, or imposing broad-based taxes that take billions of dollars from Alaskan families and the private sector economy. “These alternatives clearly demonstrate there is no easy, simple solution to addressing the State’s budget deficit. Every option comes at a cost. I believe the plan my administration put forward is what the people voted for when they elected me,” Governor Dunleavy said. Almost a week ago, Senate Democrats requested Governor Dunleavy to provide his fiscal plan immediately to the legislature and ensure it is available to the public through the Office of Management & Budget's website. Since that request, the budget is now available as of today. Senate Democrats sent a letter to Governor Michael Dunleavy on March 14th (PDF) expressing concerns about what they called his ongoing violation of the Executive Budget Act. Alaska Statute 37.07.020(b) mandates the governor to submit "a fiscal plan with estimates of significant sources and uses of funds for the succeeding 10 fiscal years." Alaska: Proposal Would Allow Alaskans to Donate All or Part of Their PFD to General Fund - A bill was introduced in the Alaska Senate this week to give Alaskans the option of donating all or a portion of their Permanent Fund dividends (PFDs) directly to the state’s general fund. “Many Alaskans have told me they wouldn’t mind giving up a portion of their dividends to pay for state government,” said Sen. David Wilson (R-Wasilla), the bill’s sponsor. Participants will be able to contribute $25, $50, $75, $100, or more, in increments of $50, up the total amount of the PFD. Southeast Alaska: POW Landscape Level Analysis Project Public Workshop Scheduled for Saturday, April 6, 2019 - The Tongass National Forest will hold a workshop on Saturday, April 6, to accept public comments on the proposed activities for the Prince of Wales Landscape Level Analysis (POW LLA) Project. This is the first of many workshops over the span of the comprehensive, 15-year integrated resource management plan. The workshop comes on the heels of a final project decision that was signed earlier this month and is being held is to present draft activities that are proposed for implementation in the near future. A wide array of activities for all resource areas will be presented so that the public can provide input on locations, activity design components, methods, mitigation measures, and integration opportunities. Disenchantment Bay north of Yakutat. Alaska Science: Alaska taking shape near Yakutat By NED ROZELL - The forces shaping Alaska never sleep, especially near Yakutat. To the west of Yakutat, Mount St. Elias rises like a white pyramid to an elevation of 18,008 feet in one of the world’s most dramatic transitions from sea to summit. The Yakutat block, a chunk of Earth’s crust larger in area than Pennsylvania, is responsible for forming Mount St. Elias and the other mountains of the St. Elias and Chugach ranges. 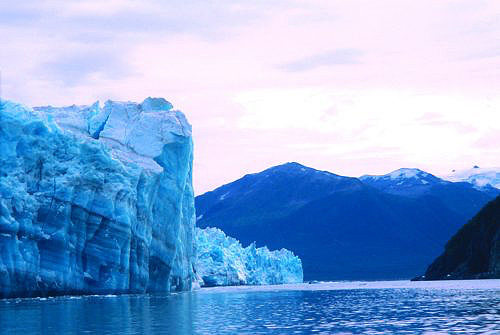 The Yakutat block formed somewhere off the west coast of the U.S. or Canada and, in a trip that took a few million years, rode the top of the Pacific plate to its present location along Alaska’s southeast coast. The Yakutat block rams into the North American plate at a speed of about 2 inches each year, twice as fast as India is shoving into Asia to form the Himalayas, according to GPS measurements by researchers with the Geophysical Institute at the University of Alaska Fairbanks. Near West Nunatak Glacier, about 30 miles northwest of Yakutat, scientists including Chris Larsen used GPS receivers to find a hillside rising toward the sky at 1 1/3 inches each year. The rise is due the ground rebounding from the weight of melting glaciers, and to a lesser extent earthquake activity. Along with the Glacier Bay area to the south, the land around Yakutat is rising faster than any other place measured, except for scattered volcanoes that are inflating with molten rock. Money Matters: YOUR TAX REFUND MAY GO AWAY, AND HERE’S WHY By MARY LYNNE DAHL, CFP®- Many people get income tax refunds annually. I do not believe that this is wise financial planning, but I recognize that it is a common method for lots of people who otherwise have trouble saving money. A refund is a loan to the government that pays no interest, so it is not a sound financial strategy, but people do it anyway, so that they can get a check from the IRS every year. Ok, I get it. They like getting a check. The federal administration passed a new tax bill called The Tax Cuts and Jobs Act of 2017. The bill was supposed to stimulate the economy by lowering corporate and personal income tax rates. The bill increased the standard deduction, eliminated or reduced certain itemized deductions, gave small businesses that operate as “pass-though” entities a 20% gross income deduction (if they meet qualifications), increased the child care credit and generally disrupted many traditional tax strategies. At this point, the jury is out on whether or not it has provided any stimulus to the economy. Thirty years later, Council continues mission to combat complacency By Donna Schantz - On March 24, 1989, the Exxon Valdez ran aground on Bligh Reef and spilled an estimated 11 million gallons of crude oil. Congress determined that complacency on the part of industry and government was a contributing factor in the accident and they mandated citizen involvement in the oversight of crude oil terminals and tankers. For the past 30 years, the Council has filled this role for Prince William Sound and its downstream communities, advocating for environmental safeguards to prevent oil spills and a strong response system should prevention measures fail. Sustainable fiscal plan, reliable funding crucial for K-12 education By Norm Wooten, Dr. Lisa Skiles Parady, Sarah Sledge - Last month, Governor Dunleavy unveiled his proposed FY 2020 operating budget, which among other drastic cuts, slashed $330 million from education funding. This budget would devastate public education and leave a bleak future for our children and communities. These severe proposed budget cuts have damaged Alaska’s reputation as a desirable place to live. Thankfully, they’ve also galvanized many citizens across the state, who realize that now is the time, more than ever, for Alaska’s budget to prioritize the things we value. Our Children Must Read by 9 By Jodi Taylor - Right now, Alaska’s public-school children are ranked dead last in the nation in fourth-grade reading proficiency, a key indicator used to measure academic success. In terms of school years, they are up to a full year behind their counterparts in other states. This means many of our fourth graders cannot read Charlotte’s Web or The Lion, The Witch, and The Wardrobe. While it may seem like such a simple, basic issue, the ability to read is actually the foundation of a child’s educational success; the value of reading cannot be stressed enough. Traveling Big Top legislative circus By A. M. Johnson - In response to an article in the Alaska Daily Planet regarding the upcoming traveling "Big Tent Majority House Circus" to confirm "What?" The following was submitted in defense of District 36 Representative's perceived efforts with this movement. "I am certain that my Representative Dan Ortiz (I) demonstrated his independence and strongly in no uncertain terms argued against this action. I wrote him and told him so. He campaigned on doing the right things and would join with the caucus that would lead into a correcting budget effort, He did, yes and deedie he did!! The Subdivision That Never Was By Harlan Heaton - About forty years ago the State of Alaska designed a ninety six lot subdivision in the Mountain Point area. The State sold over half of these lots to the citizens of Ketchikan. When these lots were sold forty years ago, the buyers were told by the State that there would be access to their lots. Fast forward to the present. These property owners still have no access to their property, and have been paying property taxes for the past forty years. The Ketchikan Gateway Borough owns eighteen of the lots in this subdivision, and pay no property tax. Alaska Mental Health Trust Authority was granted several lots in the subdivision from a settlement with the State of Alaska. These lots are also tax exempt.